A few of months ago my partner Chris came up with the brilliant idea of archiving our advanced content, white papers, cheat sheets, videos and recorded webinars into an inbound marketing library. Why brilliant? Because it allows our visitors to easily find all of the great content our team has created over the past years. Now our Resources page is the fifth most visited page on our website and has generated more leads than any other single page. The real impact though has been the obvious increase in return visits, a measure of brand loyalty. The idea of having a Resources section of your website is not new, but the way we implemented it is noteworthy. 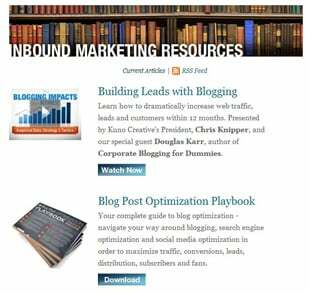 First, we filled our "library" with useful content that helps companies improve their inbound marketing results. Since we have been producing e-books, white papers, videos and webinars every month for several years, why not index that content and make it available on a 24/7 basis? The next step is to take advantage of your CMS to make it easy to update and search. We chose to implement the library in the familiar blog format, organized into different types of content on the basis of tags and searchable via Google Site Search. Again, it's a simple concept, but one that many companies miss. The impact of our Resources library has been phenomenal. Overall our captured leads have higher HubSpot "scores" now, indicating that they aren't just here for a quick glance. They are browsing the Resources section, downloading or viewing our advanced content, and coming back for more. Since the content is now so easy to find, very few are just consuming one e-book or webinar. Most leads stick around and download most, if not all, of our cheat sheets and white papers. Why is this important? Because it's a commitment. Chances are they will read or view all it, and our brand will be continuously reinforced. The more exposure, the more likely our leads will be converted into customers. This is exactly the same principle as lead nurturing, only it isn't limited to e-mail campaigns over time. Think about the great content you have produced over the past few years. Why let it gather dust on the dusty shelves of your website back pages? By building an inbound marketing library, you can make your content easy to find and consume and you can increase brand loyalty at the same time.